This is not the post that I set out to write. I had found an article discussing a woman in India who had been fined for divorcing her husband. But once I started looking for more information on my original idea, I ended up with all this. * The Purple Slinky website has an obnoxious ad popup, so be warned. And slaves in the old south needed only to jump over the broomstick backwards. But.... In modern America why is it that you only need some dude with a piece of paper he bought on line to get hitched but a barrage of lawyers to get unhitched? I know, Harvey, I thought it was fantastic! cool cake! 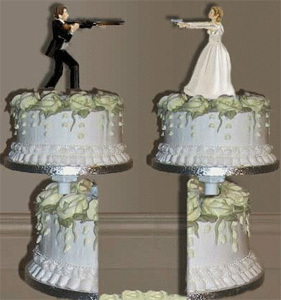 divorce is only really contentious when there is money involved. so, even though i am happily married, i know if we ever separated it would be very simple. nothing to fight over!